People always say that every woman needs a white button-down shirt in her wardrobe. This may be true but for me white button-down shirts are BORING. So, I don't own one. 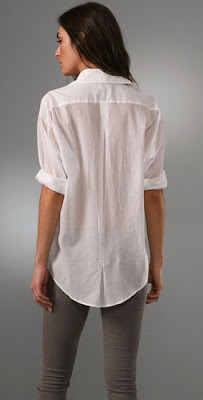 However, this white button-down shirt I would love to own. Its cut is modern and the beading on the inside of the collar makes it a little more exciting. The shirt is casual when left untucked and worn with jeans but could also be dressy when tucked into a dressier pant or skirt. I think it's very sophisticated and chic... lovely! Love this shirt, the fact that it see-through a little bit the silver detail on the collar, it's really chic I think!